There are so many ways to pit the New England Patriots against the Atlanta Falcons, review the stats, compare players, or detailed analysis of plays and strategy. At Justin Harvey we decided to ignore everything football and take a look at the fashion choices of the team's Chairman to determine the winner of the big game. Not that the way a Chairman of the team dresses has a direct link to the team's success, but it does speak to the type of man that is in charge. As the co-founder of Home Depot one would think that Mr. Blank would be influenced to dress in a more working man's style but his background as an accountant seems to prevail in his fashion choices. In the vast majority of the pictures we could find he dressed on the formal side, a dark suit, white shirt and a red tie. He does wear some colored suits and other conservative ties, but almost always he has on a crisp white shirt, tie with matching pocket square and cuff links. His fashion choices portray a business man, which is what he is. A strongly conservative look with class. His fashion choices lead us to believe he will guide his team in a serious and business like manner. He appears as the classic Chairman of the board, a successful business man who loves the business of football. This leads us to believe his team will play a fairly conservative offense with a strong grounding in the basics of the game. Defensively his fashion choices tell us he will be stable and relentless. He does show a bit of flair in his fashion choices occasionally and that will be reflected in the game strategy, strong and consistent with a few bold moves, but not too bold. Robert Kraft has style. His fashion choices are a little varied with some key elements he consistently wears. Much like Arthur Blank, he is all business but Robert brings a bit of daring. Kraft has stated that he started his company, International Forest Products, out of a hunch that the increase in international communications and transportation would lead to an expansion of global trade in the late twentieth century. From all the pictures we could find a few things stood out. His fashion choices have a conservative base with some key differences that make him stand out. He wears dark suits, with a variety of ties and matching pocket square, with red being the most common, and consistently wears a colored shirt with white cuffs and collar like the Marcello Sport dress shirt with neat trim. Mr. Kraft has been known to wear ostentatious cufflinks, and his accessories have even impressed the most flamboyant pro athlete of all, Floyd Mayweather. In 2015 Kraft was spotted wearing what appeared to be Super Bowl ring cufflinks at a Sunday game. Now that is some bold bling. His fashion choices lead us to believe his team will be bold, confident and take calculated risks. He appears as an aggressive individual and Chairman, a successful business man who loves the game of football. This leads us to believe his team will play an aggressive offense with the occasional high risk play . Defensively his fashion choices tell us his team will be forceful and willing to take risks rather than hold the line. His bold fashion choices will be reflected in his team's aggressive and stylish game play while confidently taking risks. At Justin Harvey we like men who are willing to take a little risk, be it in football, business or fashion. 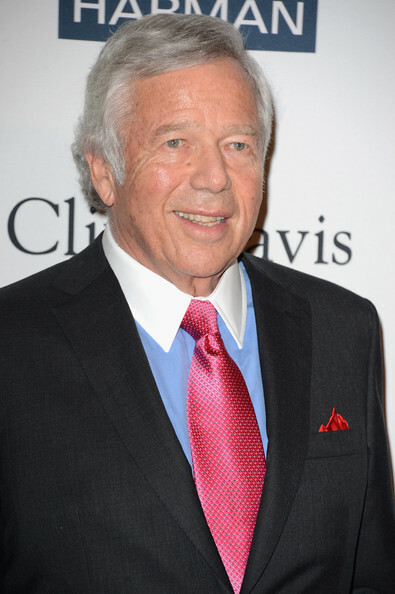 Judging only by the fashion choices of the Chairmen we are compelled to choose Robert Kraft as the enviable winner based on his bold fashion choices. Our customers tend to be leaders and risk takers, willing to dress impressively, putting together their own unique style with quality uncommon fashions for a unique impression. No matter who wins, dressing with style always make you a winner and Justin Harvey has the unique fashions to ensure your style will be unique and impressive.